As a manufacturer direct distributor, we provide you with the best brands at the lowest prices. Extend the life of your tires and make flats a thing of the past with our affordable flat proofing system. Our trained and certified tire technicians can conveniently come to your yard or jobsite to service your wheel assembly. Understanding and correcting the causes of tire failure helps lower overall tire oerating costs. As a direct distributor, ICT provides National Account pricing and invoicing for virtually all brands. ICT carries wheels for virtually all Ag and turf applications, large and small. Achieve better traction and greater stability with freeze-resistant ballast. 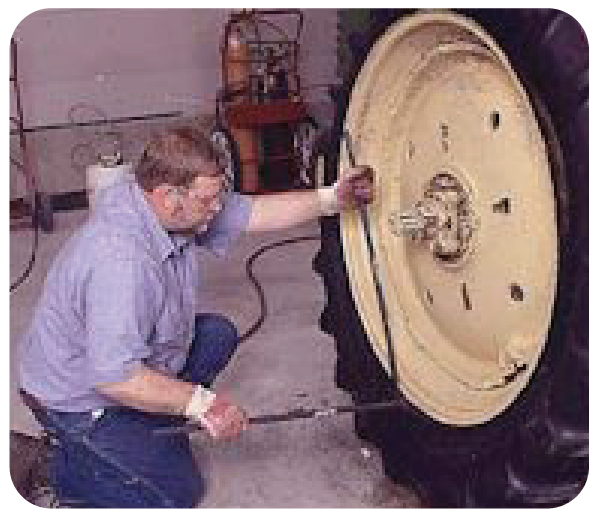 Keep your equipment looking its best with our steel wheel reconditioning services. Assure state and federally compliant disposal of your scrap tires. With State and Local contracts, ICT has you covered.